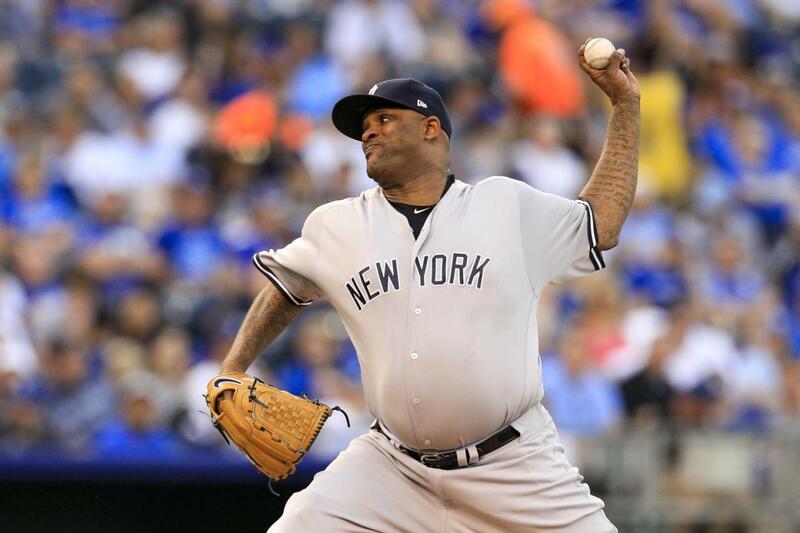 After giving up 22 runs in his previous four starts, CC Sabathia had his best game since his season opening start. He pitched 6 2/3 innings of scoreless ball to help the Yankees defeat the Kansas City Royals, 7-1. He only gave up five hits and two walks while striking out four. The effort dropped his season ERA from 5.77 to 4.93. He did get into a little trouble in the seventh inning when the Royals loaded the bases with two outs. Joe Girardi pulled Sabathia, and Tyler Clippard was able to get the last out by swinging strikeout to preserve the scoreless outing for Sabathia. This is one of those games where everyone who played contributed in some way with a run, hit, or RBI. The biggest hit was clearly the three-run homer by Gary Sanchez in the third inning. It set the tone early and the Yankees were in control throughout. Chris Carter finally did the one thing he is paid to do with a two-run dinger in the fourth, his second of the year. Carter was 3-for-4 on the night, making it easily his best game as a Yankee. Chase Headley deserves kudos for his amazing catch of the first pitch hit to start the game. The Royals scored their only run in the ninth inning against Jonathan Holder on a fielder’s choice force-out with the bases loaded. Things could have gotten hairy from there, but Holder got Alcides Escobar to pop up to Didi Gregorius to end the threat and the game. I have to say that the outing by Sabathia was bittersweet. It buys the left-hander more time in the rotation, potentially setting us up for disappointment when we need him the most. It’s one of those things that I hope I am wrong and CC shows he is capable of putting up more quality starts than not. But one must recognize this wasn’t the Houston Astros, Baltimore Orioles or Boston Red Sox facing Sabathia. The Royals are the worst hitting team in the American League at .226/.289/.355. For his career, Sabathia is 20-11 against the Royals in 38 starts, with a 3.11 ERA. I am glad that he likes to pitch in Kansas City, where he is 13-5. Now, I am hoping that Michael Pineda and Jordan Montgomery enjoy Kauffman Stadium as much as Sabathia has. The Yankees (23-13) remain a half-game ahead of the Baltimore Orioles in the AL East. The Orioles beat the Detroit Tigers on Tuesday night in slugfest, 13-11. It took two homers by Chris Davis in extra innings for the O’s to win. Former Yankee Justin Wilson blew a save opportunity for the Tigers in the ninth, while former Yankee Richard Bleier took the win for the O’s. Sadly, the Boston Red Sox also won, defeating the St Louis Cardinals, 6-3. The Sox are four games back. I was surprised to see the Arizona Diamondbacks have released former Orioles lefty Brian Matusz. It doesn’t seem like that long ago he was a highly touted pitcher for the O’s but struggled as a starter. He eventually found some success in the pen. I always liked him and wanted to see him fulfill his promise (albeit not against the Yankees) but it was not meant to be. Matusz is only 30 but I don’t see anything in his numbers to warrant consideration as a reclamation project. It’s sad to see. I am sure that someone will take a flyer but I don’t think the Yankees should. Speaking of former Yankees, Robinson Cano has been placed on the disabled list for the first time since 2006 when he was still with the Yankees. He injured his right quadriceps last week and had been expected to return yesterday. 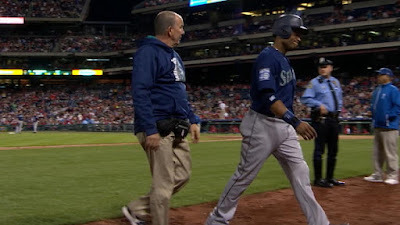 The Seattle Mariners opted to place Cano on the 10-Day DL retroactive to May 13th. While Cano had a great season in 2016 and was off to a good start in 2017, he is 34 and the risk of injury continues to increase. Proof the Yankees were smart not to pay Cano $240 million for ten years (as much as I would have liked to have seen the player wear pinstripes throughout his career with an eventual Robinson Cano Day that he’ll never see at Yankee Stadium). I do wish Cano a quick return to good health and that he is able to return to the Mariners lineup on May 23rd. Congratulations to Mike Ford. The first base prospect was recently promoted from the AA Trenton Thunder to the AAA Scranton/Wilkes-Barre RailRiders and he had a big game yesterday to help defeat the Pawtucket Red Sox, 7-2. Ford was 2-for-3 with a two run shot off Henry Owens, a pitcher the Yankees are familiar with at the big league level. Tyler Webb took the win in relief of Bryan Mitchell with 3 1/3 innings of scoreless work and six K’s. Webb, returned to the Yankees this spring after being taken by the Pittsburgh Pirates in the Rule 5 Draft, should get a shot in the Yankees bullpen sometime this year if a spot on the 40-man roster opens up. 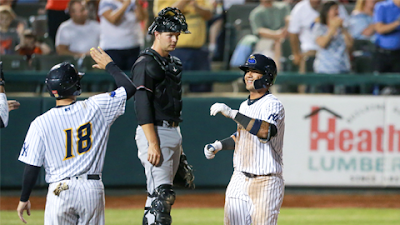 Meanwhile in AA, Gleyber Torres hit a tie-breaking game-winning two run homer in the eighth inning yesterday as the Thunder beat the New Hampshire Fisher Cats, 4-2. Just another day at the office for the supremely talented infielder. Have a great Wednesday! I hope it’s another royally wonderful day for Yankees fans!